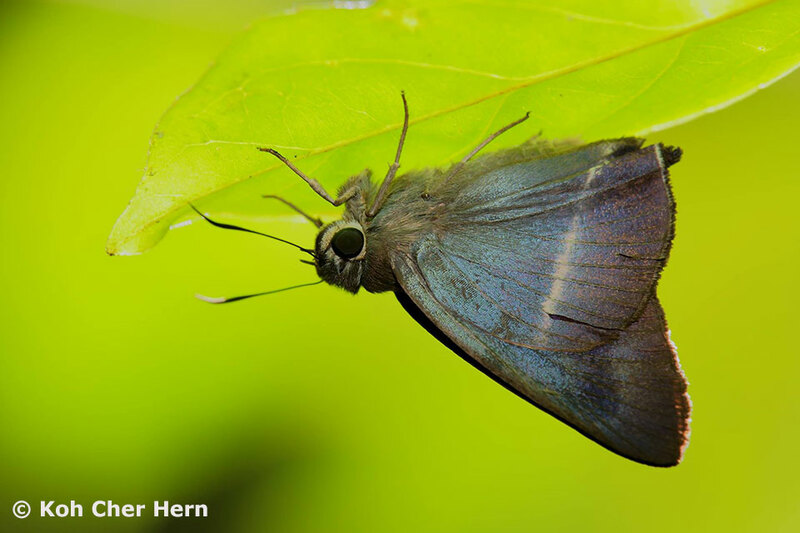 In last week's blog article, we featured an interesting and peculiar habit of some species of butterflies. These butterflies have a propensity of perching under a leaf to hide, sometimes with their wings folded upright, others with their wings opened or flapping slowly. 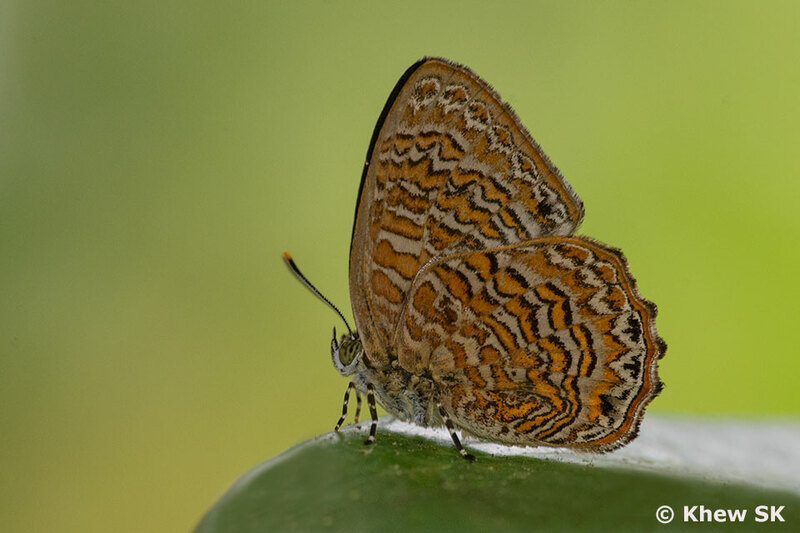 Not all butterflies do this, but only a handful and isolated to a few of the butterfly families found in Singapore. 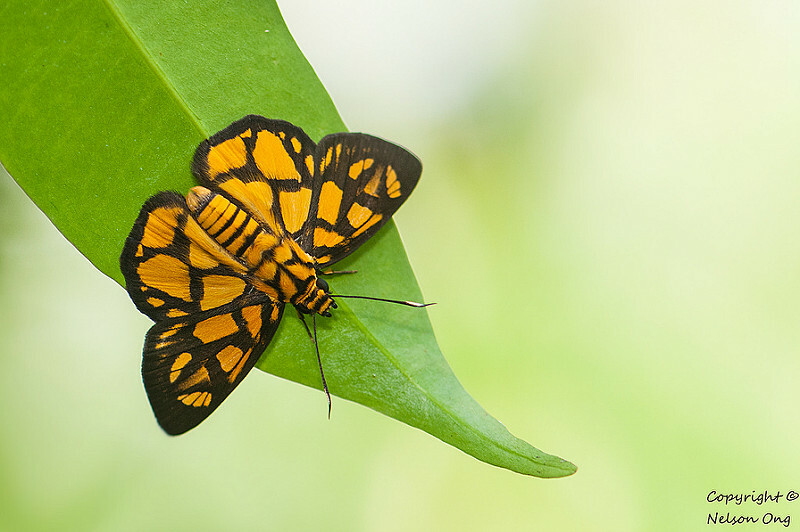 Their reasons for doing so may be common sense - either taking shelter from the heat of the sun, or pelting rain, or even to hide themselves from would-be predators. Even if this is so, then why only these few species? Why don't all butterflies adopt this behaviour? I doubt if these questions can be definitively answered. This is probably one of a myriad of Mother Nature's mysteries. The upside down behaviour is likely to be an evolutionary process of some of these species, carried in their DNA for generations. Each successive generation adopts the identical habits and seems to know what to do without being 'taught' how to do so. 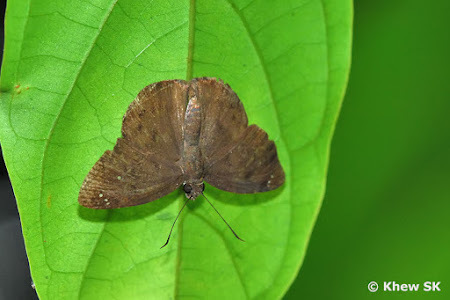 The Riodinidae found in Singapore do not display the under-leaf habit, despite many species in other parts of the world doing so. We now take a look at the next family of butterflies, continuing from last week's article - the Riodinidae. 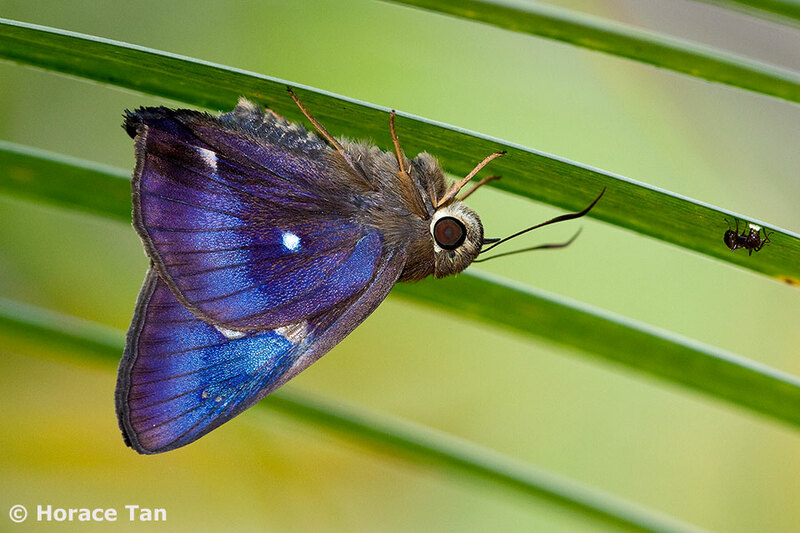 This family, known as the "Metalmarks", is represented by only 5 species in Singapore. Across the globe, in South America, many of the magnificent metalmarks are well-known to always perch under a leaf, either with their wings opened flat, or folded upright. However, all the 5 Riodinidae species in Singapore are not known to display any under-leaf habits at all. Most of them are usually seen on the top surfaces of leaves, and has a habit of twisting and turning with half-opened wings. 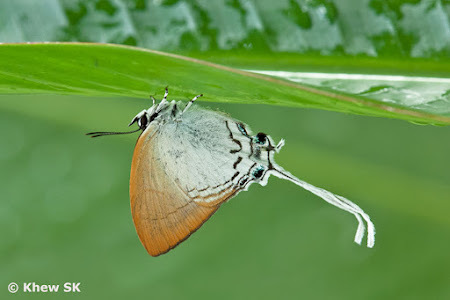 Turning our attention next to the Lycaenidae, which is the largest family of butterflies found in Singapore, we observe that of the 2 members of the sub-family Curetinae, one of them - the Sumatran Sunbeam is known to perch on the undersides of leaves with their wings folded upright. 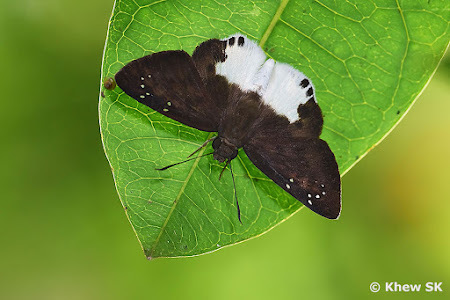 Often, their bright white undersides make them very visible when they hang upside down under a leaf. However, the other related species, the Malayan Sunbeam, rarely displays such behaviour. 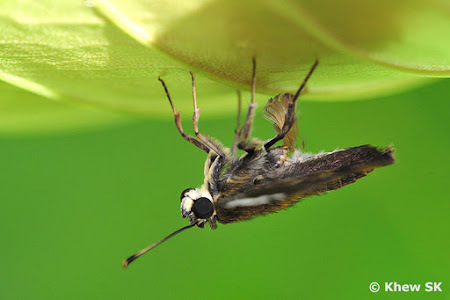 The other subfamilies, Miletinae and Poritinae, do not display any upside down habits, preferring to stay on the tops of leaves, or in the case of the Miletinae, they adopt whatever convenient posture needed when feeding on the secretions of mealy bugs or aphids. I have not come across any Polyommatinae (the Blues) that perch on the undersides of leaves either. The family Aphnaeinae is represented by two species - the Club and Long Banded Silverlines in Singapore. I have occasionally seen the Silverlines perched on the underside of a leaf. 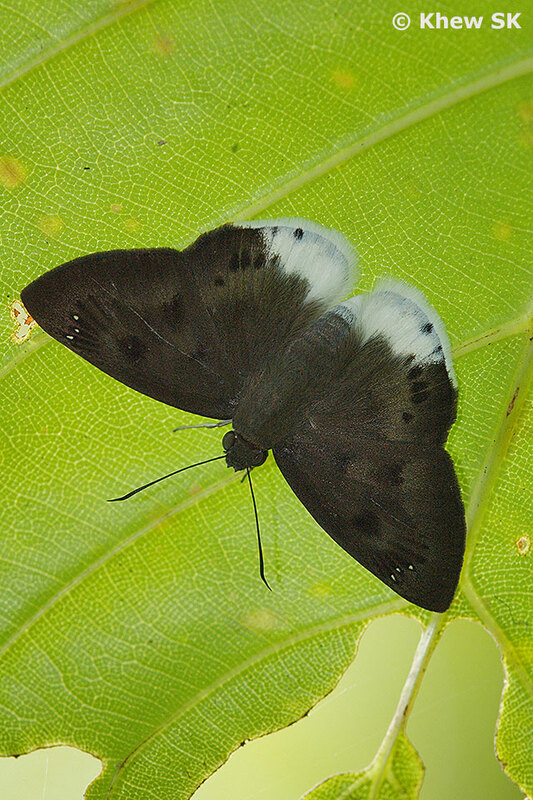 However, this is not a regular behaviour, although we can count the Silverlines as being one of them displaying this under-leaf habit. In the last sub-family, Theclinae, there are one or two species, particularly amongst the long-tailed ones, that occasionally display the habit of perching under a leaf. However, again, this habit is not predominant but only occurs uncommonly from time to time. There have been times when I encounter an individual under a leaf, but they appear to be foraging for something or feeding. Some of the Rapala spp are known to do so. 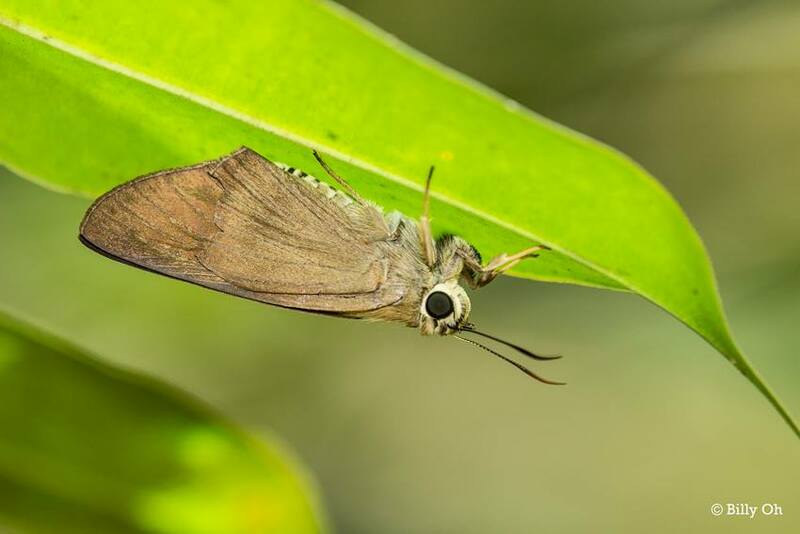 But infrequent are the occasions when I encounter one that is just perched on the underside of a leaf, doing absolutely nothing. However, in Malaysia, there are certain species of the genus Dacalana and Neomyrina that are typically found perched in the upside down position. 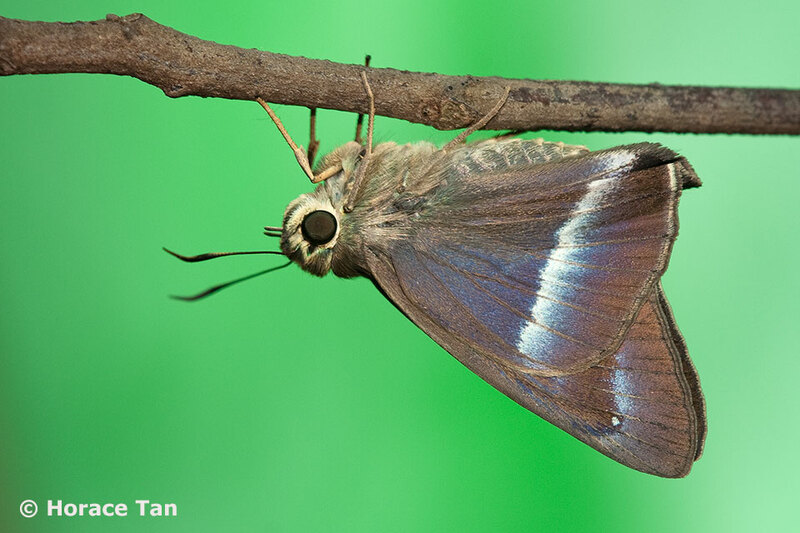 These species are not found in Singapore. We now move on to the final family, the Hesperiidae or Skippers. Amongst two of the sub-families Coeliadinae and Pyrginae are many species that consistently displays the under-leaf habit. The sub-family Hesperiinae has no known examples of perching under a leaf. We will now feature the species from the Coeliadinae and Pyrginae that regularly perches in an upside down position. The first group will be the Awls. 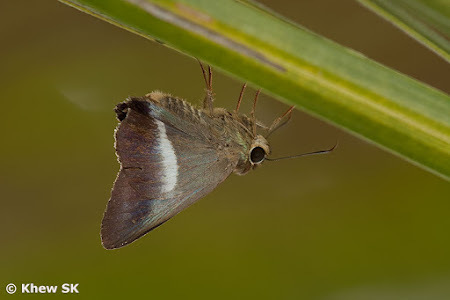 These species, belonging to the four genera Badamia, Burara, Bibasis and Hasora, are known to be crepuscular (active during the periods of dawn and dusk) in habit. When encountered, they can often be seen to perch upside down on the undersides of foliage usually in the early morning hours before 8 or 9 am, or during the later hours of the day in the deep forest understorey. 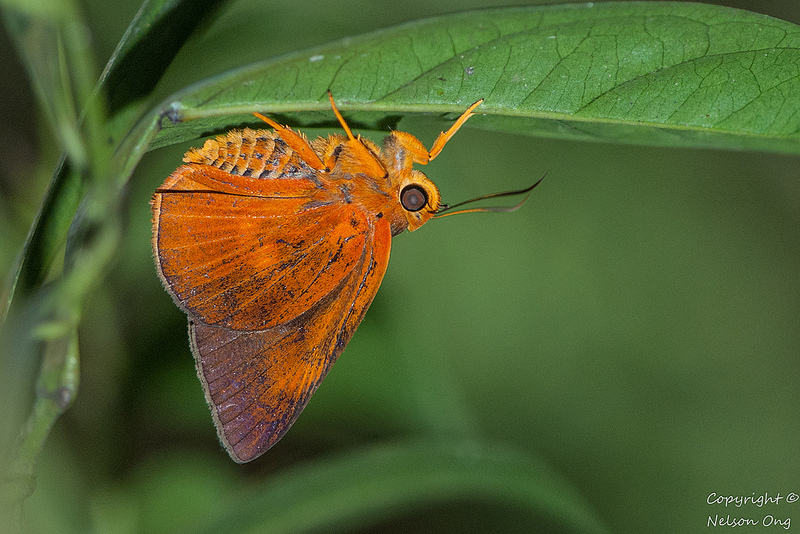 Amongst these, the Brown Awl, Great Orange Awlet, Orange Awlet, Plain Banded Awl, Common Awl, Yellow Banded Awl, Common Banded Awl and White Banded Awl can regularly be observed to perch on the underside of a leaf in forested areas. 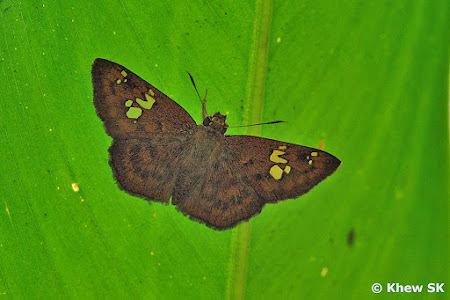 A few of them can be active during the later hours of the day, like the Yellow Banded Awl and White Banded Awl, but usually in deep forest and hiding in the shade under a leaf. 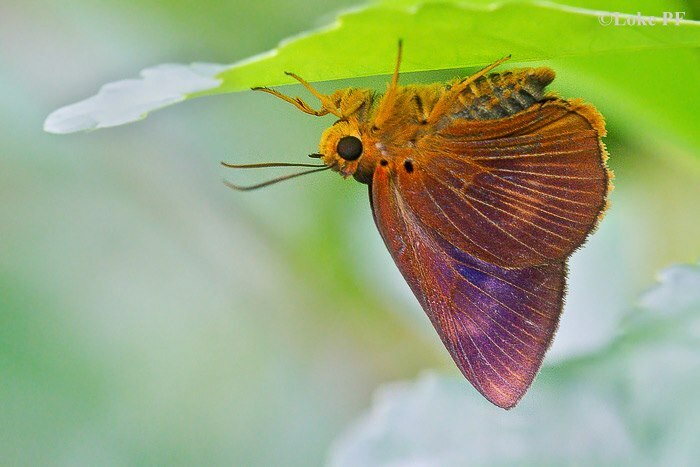 These robust-bodied skippers are fast-flying and zip rapidly from perch to perch, sometimes even buzzing close to an observer, before settling on the underside of a leaf to hide. I have not come across the sole member of the sub-family, the Orange Tailed Awl, hiding under a leaf, but it is very likely that it also displays this habit. 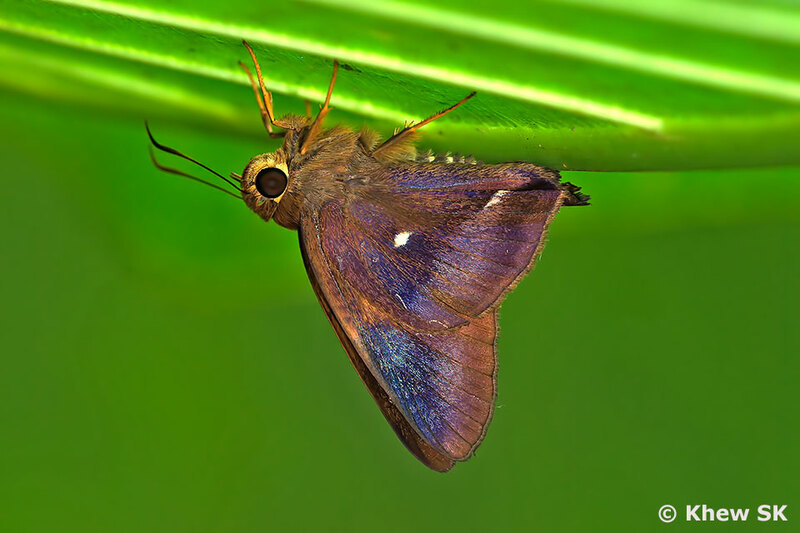 The final sub-family is the Pyrginae (commonly referred to as the "Flats"). The species of this sub-family tend to open their wings flat (hence the collective name). 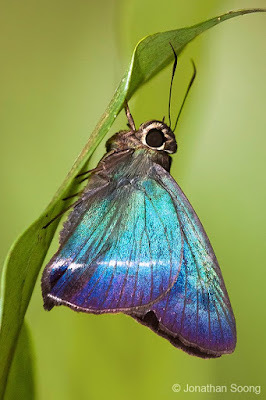 However, during certain hours of the day, after they are done feeding on flowers, they will fly rapidly and hide upside down under a leaf - still with their wings opened flat. 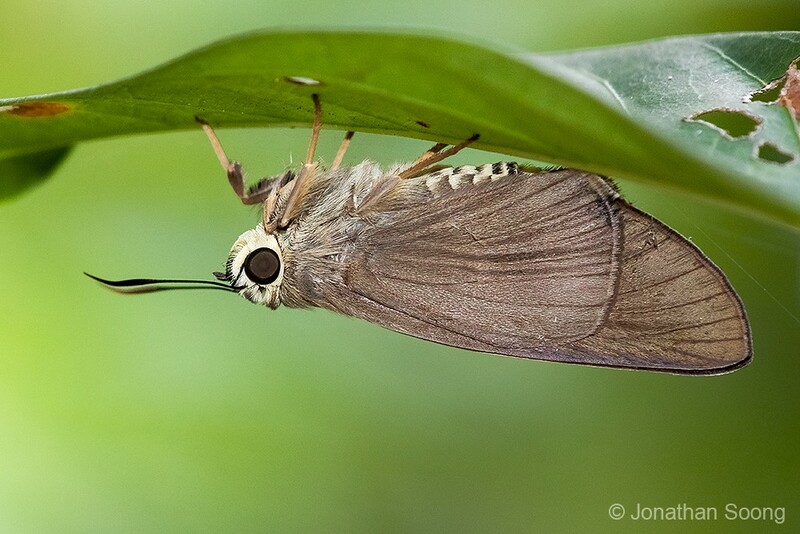 When behaving like this, it is challenging to photograph them, especially when they are perched on a low leaf. 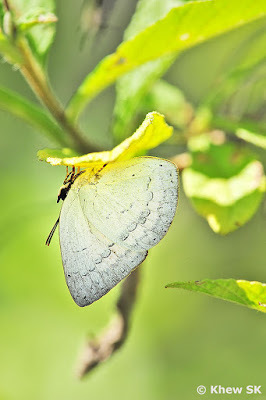 Amongst the Flats that have been frequently seen perched under a leaf with their wings opened flat are White Banded Flat, Fulvous Pied Flat, Hieroglyphic Flat, Common Snow Flat, Large Snow Flat, Ultra Snow Flat, Malayan Snow Flat and Chestnut Angle. 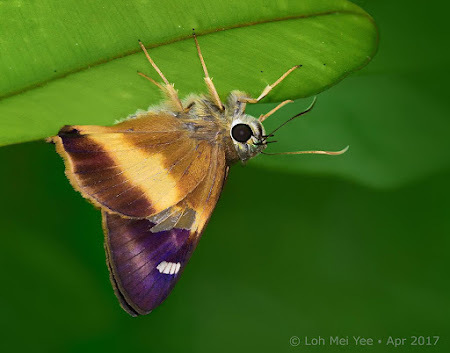 Whilst there may not be photos of the other species found in Singapore to show that they perch under a leaf, it is most likely that they do. A quite a few of these Pyrginae are very rare. 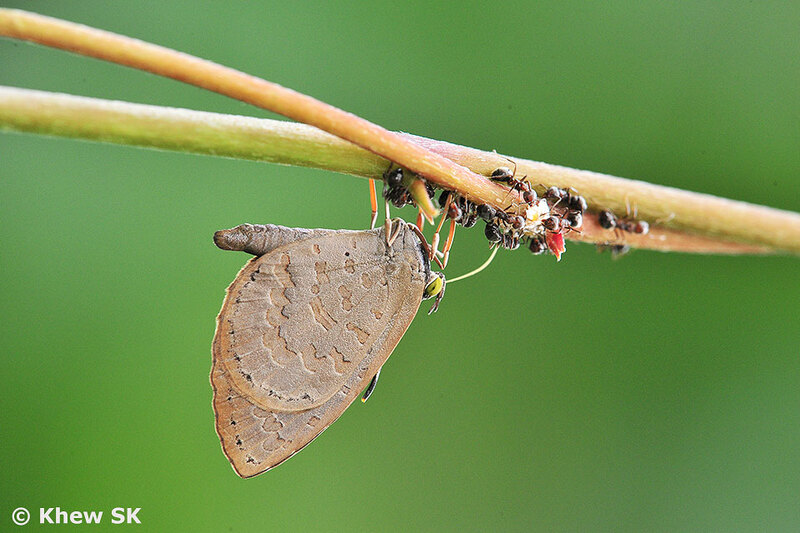 However, their under-leaf behaviour is limited to certain hours of the day when they are not feeding or sunbathing. 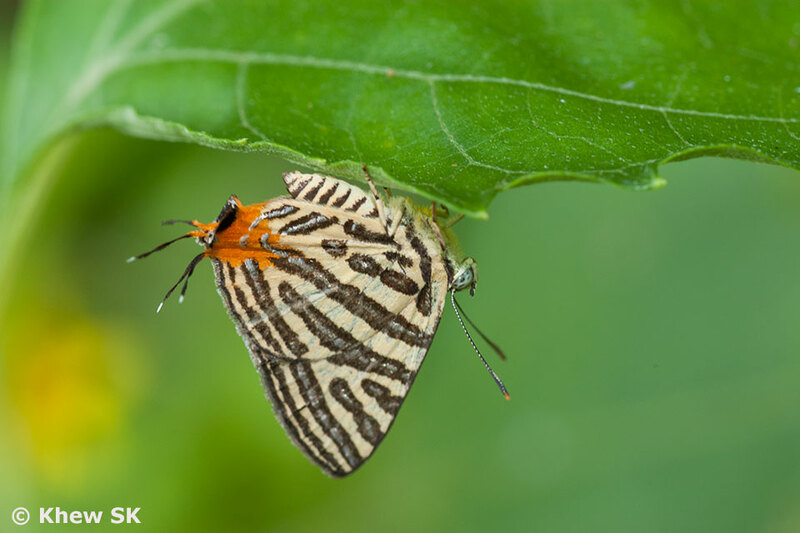 And so we complete our observations on this peculiar habit of perching upside down on the underside of a leaf by some butterfly species. 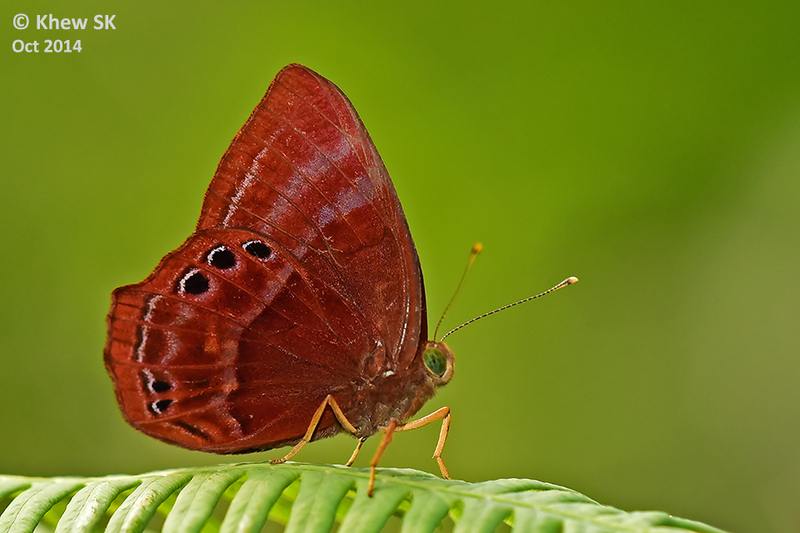 Perhaps some researcher will one day discover the purpose of this unique habit that only certain species of butterflies display. 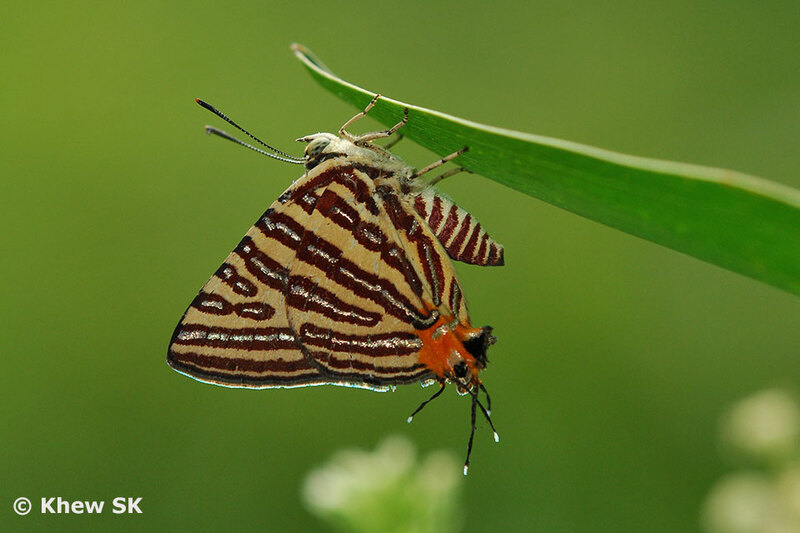 Until then, we can just observe and wonder about this under-leaf behaviour amongst these butterflies.